As a teenager growing up in Florida in the late 1990s, the Pakistani-American writer Aisha Saeed says that she knew better than to try to do certain things her friends took for granted. "I didn't even ask about going to prom," she says. "I didn't even try. I wasn't allowed to have a boyfriend. I guess I do wish I had gone now." But at an early age, Saeed says she realized that the other girls she grew up with had a very different experience, one that often had devastating consequences. "I had a friend and when we were 14, she said to me, 'I have a secret,'" she says. "And the secret was that she had a fiancé who was 10 years older. At the time, I didn't know what it meant, and I thought it was like having a boyfriend." It wasn't until her friend's wedding day approached when she was 18 that the reality of it all sank in. "She didn't want to do it," Saeed, who is now 35, recalls. "But she was afraid her parents were going to disown her. I had a lot of friends and none of them -- even though they had higher GPAs than I did -- really went to college because they got married instead." 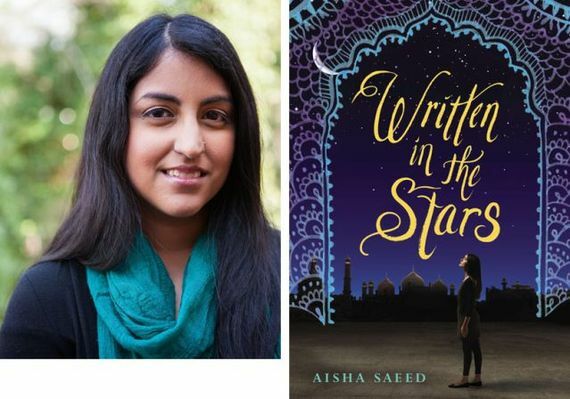 Watching her friends go through these experiences (and the many subsequent divorces), was what partially inspired the plot of Saeed's debut novel, Written in the Stars. In it, 17-year-old Naila, a college-bound senior with a promising future, is whisked off to Pakistan by her family because they discovered she was secretly meeting a boyfriend. What Naila originally thought was an extended vacation quickly turns into an indefinite stay as her parents openly searched for a suitable husband for her. "Naila's parents just don't see that what they are doing is wrong," says Saeed. "And even Naila says she realizes that this would be a great life for someone, but that someone wasn't her." It isn't giving anything away by saying that Naila eventually gets a happy ending -- though she suffered several enduring physical and emotional scars because of her ordeal. "The title of the book is 'Written in the Stars' because that's just how it is, it's kismet, it's destiny. But readers will see that just because something bad happens to you, that doesn't mean that that's your destiny. You just have to fight a little bit more."